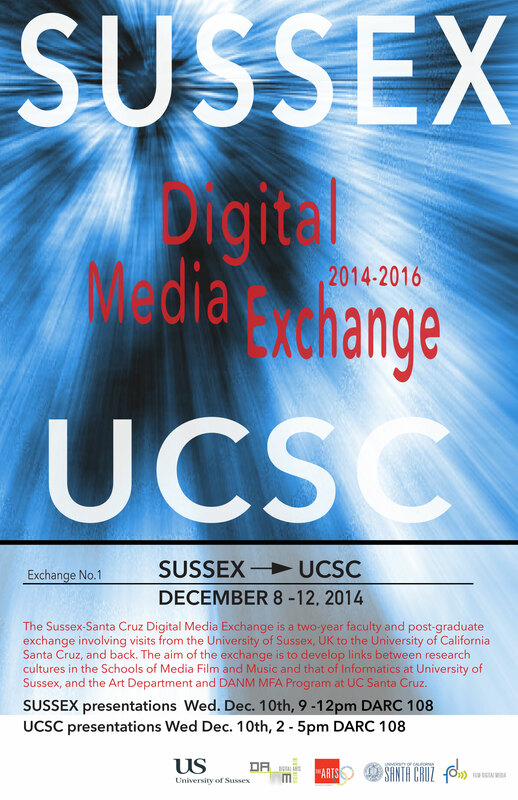 The Sussex-Santa Cruz Digital Media Exchange is a two-year faculty and post-graduate exchange involving visits from the University of Sussex, UK to the University of California Santa Cruz, and back. The aim of the exchange is to develop links between research cultures in the Schools of Media Film and Music and that of Informatics at University of Sussex, and the Art Department, Film and Digital Media Department, and DANM MFA Program at UC Santa Cruz. The overall objective is to develop a durable partnership through postgraduate student and faculty mobility, and enhance theory and practice in computational and digital media research. To this end a group of 2 faculty and 4 students from Sussex will visit UC Santa Cruz December 8-12, and a group of 2 faculty and 4 students from UC Santa Cruz will visit the University of Sussex March 23-27. These visits will involve a program of events and engagement with the wider research community in each institution with the aim of making broad links as well as offering opportunity for collaboration between individuals. Students and faculty will attend seminars and lectures, give presentations on their own work, explore each other’s research cultures and exhibition opportunities, engage with events in the respective locations, and explore possible funding opportunities.